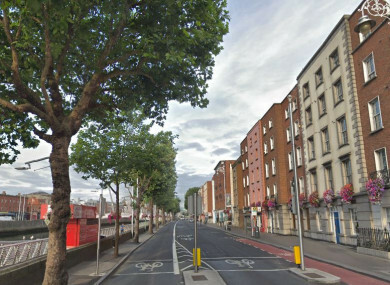 The attack happened at Bachelors Walk in Dublin city centre. A TEENAGER LAUNCHED a “completely unprovoked attack” on a Mexican national that resulted in the victim losing half of both his front teeth, a court has heard. Clayton Brennan (19), of Dunawley Grove, Clondalkin, Dublin, pleaded guilty at Dublin Circuit Criminal Court to assault causing harm at Bachelors Walk, Dublin, on 27 April 2016. Garda Eric Keogh told Garrett McCormack BL, prosecuting, that Mexican national Jose Mondragon was sitting on the boardwalk outside the Arlington Hotel when Brennan sat beside him. Mondragon attempted to leave, only to be surrounded by a number of youths. Brennan put his hands together and hit Mondragon in the temple causing him to fall to the ground and strike his mouth against a tree pot. Brennan pushed him to the ground repeatedly as he tried to stand back up. Mondragon escaped by jumping over a wall once Brennan stopped pushing him. Speaking in court, Mondragon said that he had come to Ireland to learn English. Half of his two front teeth were lost in the assault and the total price to repair them was €4,205. As Mondragon walked past Brennan after giving his statement to the court, Brennan extended his hand to him and Mondragon shook it. Brennan, who was 16 years old at the time of the offence, has eight previous convictions. These include an offence of assault causing serious harm at Dame Lane, Dublin, in May 2016 in which he “glassed an individual”. He is currently serving a five-year sentence with the final two years suspended for violent disorder, arson and criminal damage. These relate to an incident on 29 August 2016 in which a unit at Oberstown Children Detention Campus was set alight and had to be demolished. Brennan is set to be released from custody on 30 January 2020 and will remain under supervision of the Probation Service for a further 18 months. Kevin White BL, defending, said that his client had been the victim of significant bullying throughout his schooling, including incidents in which his shoes were stolen and he was pushed into a bonfire. White said his client showed guilt and remorse for committing this offence. He extended an apology on Brennan’s behalf to Mondragon saying that he had “wanted to show himself as a tough man in front of his friends”. Judge Sinéad Ní Chúlacháin said this was a serious and “completely unprovoked attack”. She ordered a probation report and adjourned the matter until 4 February 2019. Email “Teen launched 'completely unprovoked attack' that resulted in victim losing half of both his front teeth”. Feedback on “Teen launched 'completely unprovoked attack' that resulted in victim losing half of both his front teeth”.